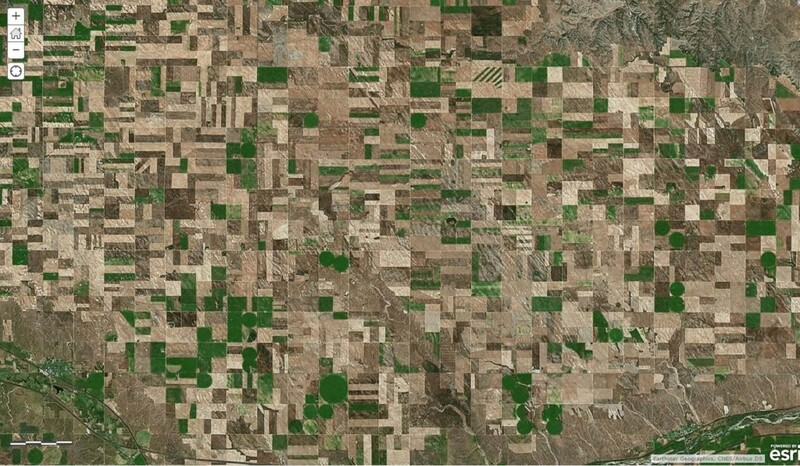 Flying over the western US, you can’t help but notice the vast patchwork of square parcels of land. Perhaps the largest subdivision in the world, these six-mile square townships, each containing 36 sections, have a storied history and colorful cast of characters who braved the Wild West to survey millions of acres. That riot of rectangles we see from the stratosphere is Thomas Jefferson’s vision realized. How we manage that patchwork isn’t common knowledge, but it’s pretty cool. In addition to being the stewards of the country’s natural resources, the Bureau of Land Management (BLM) also manages these shifting squares. Specifically, it collects, records, and shares the data on all of the corner locations that make up the Public Land Survey System (PLSS). Since the original surveyor’s compass and chain, measurement technology has improved and better positions have been catalogued over the centuries. When the corners of those squares are updated with new and more accurate positions, the location of other corners change and require adjustment. Now think of these measurements between the corners as threads in a fabric. As you gather more accurate measurements and pin this fabric to the earth with precise latitude and longitude via GPS technology, all the fabric’s corner positions improve. These adjustments can’t be done with simple technologies like rubber sheeting or fitting to an orthophoto. For that, a more sophisticated mathematical analysis called least squares adjustment (LSA) is needed. If you’re curious how this works—and, let’s be honest, who isn’t?—here’s a layman’s definition: LSA minimizes the sums of the squares of the residuals. Are we clear so far? I didn’t think so. So let’s define a few things. A residual is the difference between a raw measurement and an adjusted measurement. Because no measurement is perfect, we need to adjust it a bit so that everything “gives” a little. This is like stretching and compressing threads in a fabric; it’s creating “wiggle room” to make further adjustments. Because we know that some measurements are better than others, we can weight the better measurements as more important and less in need of wiggle room (adjustment). We square the residuals (I’m not exactly sure why, to be frank), and the result is that everything adjusts (moves) the least amount based on the best mathematical fit—thus minimizing the sums of the squares of the residuals. That’s LSA. With the super accuracy of GPS technology, we can “pin” the fabric to the face of the earth and only adjust between these control points. As new and better measurements and control points (pins) are added, the location of everything incrementally improves. Imagine the effort it takes to survey, catalogue, maintain, and continually share this data with the millions of residents of the 30 western states. Until now, that data has been manually maintained, difficult to keep current, and divorced from the geographic context. Because of these impediments, the BLM recently adopted specialized COTS technology called the Esri Parcel Editing Solution—also known as the “parcel fabric”—to maintain, improve, and share this data. The county assessor’s office (or other local government office) maintains parcel and ownership data, which overlays on the PLSS fabric. So what happens when the BLM collects new information and adjusts the PLSS fabric? The county parcel map no longer overlays correctly. To fix that, the county can also leverage its data in the parcel fabric and pin its patchwork to the PLSS. When BLM makes adjustments, the county fabric just automatically fits removing the need for re-mapping and rubber sheeting to align. This is how the parcel fabric stitches together and helps us manage Jefferson’s Quilt. The parcel fabric also overcomes the challenge of organizing parcel data at the state level. It has now enabled states like Montana and Nevada to load extremely large datasets consisting of millions of polygons into their land management systems. Combined with other COTS tools, such as Esri Community Parcels, cities and counties can now easily aggregate parcels to the state, resulting in better addressing systems, more accurate E-911 response, and more efficient resource and revenue departments. Currently, more than 40 states either have statewide parcels or are working on a statewide parcel program. When Jefferson commissioned Lewis and Clark to explore the west, he sent them on a noble mission to study nature, geology, and the geographic importance of the Louisiana Purchase to benefit the country as a whole. Maintaining that patchwork is no less beneficial to the country today. If only Jefferson could see the quilt the U.S. has become, he’d be impressed that we have a system to automate all that geometry—largely thanks to GIS.